Moonlight Breakfast is a fresh, self-declared retroelectro quartet comprised of lead singer, Christie, Bazooka (producer, plays drums, clarinet), Printzu (bass, electric guitar), Adita (guitar, keys, sampler). Every single they’ve released so far: „Still”, „Shout”, "Play" "Hello"and "No More" has reached the top positions in Romania’s best alternative radio charts. (“Shout” actually entered the charts at No1). In January 2012 Superfly Fm, from Vienna also started airing "Play", "Silent Disco" and more recently, "No more". They were invited to have a live acoustic session in the Superfly studio to promote their album, this July. It is the second week that "No more" is no 1 in the Guerrilla chart. Their first performance was on the 2nd of July 2011 as the opening act for the Jamiroquai concert that took place on the Black Sea Coast. 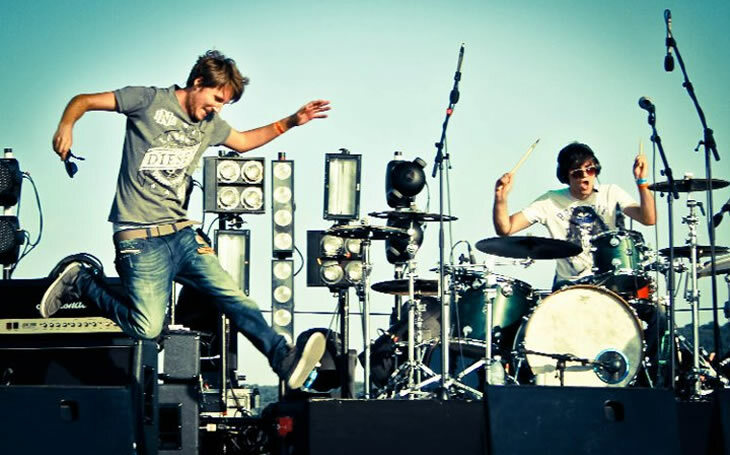 They went on to play in European Festivals such as Summer Well (Romania) and Spirit of Burgas (Bulgaria). The UEFA officials chose Moonlight Breakfast for the VIP Lounge at the Europa League final which took place on the National Arena in Bucharest. On the 10 th of February, they started their first national tour in collaboration with Red Bull, called New In Town Tour. The great relationship with Red Bull also took them to the closing party of the Transilvanian International Film Festival 2012. They released their first album, called "Shout" on the 19th of July. The 3000 invitations to the album release concert were all taken one day before the event.